Motorhomes are a great way to travel, giving you all the comforts of home on the open road, or parked in Aunt Matilda’s driveway. Once you settle into camp, you will remember you forgot to buy Pringles, and you can’t live without Pringles! But now, in this moment, the motor home becomes a burden. A quick run to the store isn’t so quick, when you have to re-pack all your cargo, and then drive your large coach into the middle of a tiny town. Having a small car available, for such errands, is the reason why most motorhomes you see tow a vehicle behind them. 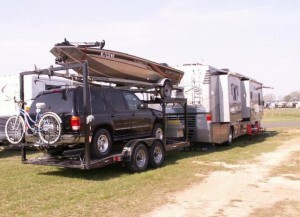 Many different cars can be towed behind an RV, just make sure that the weight of the car does not exceed the recommended tow weight of the RV. Two-wheeled dollies, and four-wheeled trailers, are available to tow your vehicle with, but these are very expensive, and rather large pieces of equipment. 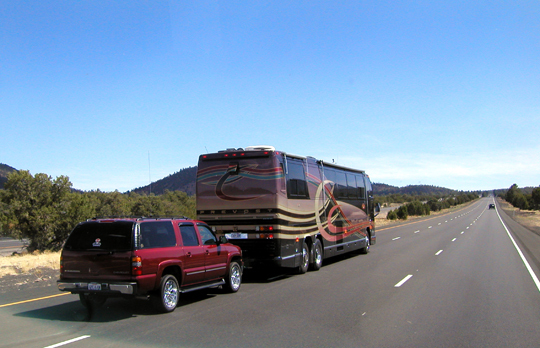 The best vehicle, to tow behind an RV, is one that can be flat-towed. This is towing a vehicle, behind an RV, with four wheels down. It is also called dinghy-towing, or four-down-towing. 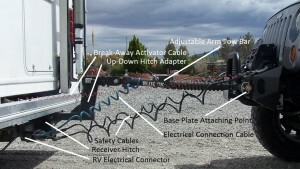 It involves attaching a tow vehicle to an RV using a tow bar, so that the vehicle rolls along behind the RV on its own four tires. Nowadays, with the advent of the automatic car, advance planning is required, when selecting the best vehicle to tow behind an RV. Hearty off-road adventures would be awesome, with vehicles such as Toyota’s FJ Cruiser, or the Land Cruiser. These cars are great on rough road, but are not cars you can flat-tow behind an RV. The reason you ask? It’s all about the transmission lubrication. The transmission lubrication needs to flow, and this does not happen when you flat-tow a Lexus or Scion with automatic transmission. Not all their manual vehicles are made the same either. Some of them require continuous lubrication, or you will damage the transmission of your car while towing it four-wheels-down. 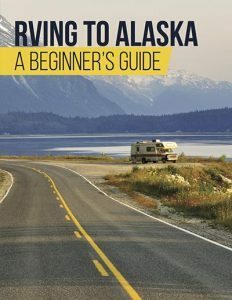 Theoretically, any vehicle with rear-wheel-drive and a manual transmission, or a four-wheel-drive with a manual transfer case that can be put in neutral, can be towed behind an RV. Your vehicle’s manual will clearly state if the vehicle can or cannot be towed four-wheels-down. Equipment is available that enables you to tow automatic-transmission vehicles four-wheels-down, but this can be expensive, and if not used, or installed, correctly can damage the drive train, thus voiding your warranty. Find a car that is already factory-ready to tow. Some vehicles require that you stop periodically and run the transmission, so as to lubricate it, or you will risk incurring damage. Some require that you remove certain fuses before you begin towing. Vehicles, whose steering locks are triggered by the ignition, need to be towed with the keys in them. If the key is placed wrongly, your battery will be completely drained by the time you get to your destination. Do not rush when deciding on your tow car. Your RV lifestyle determines what kind of car you should be looking at, but so does your RV’s maximum tow weight. 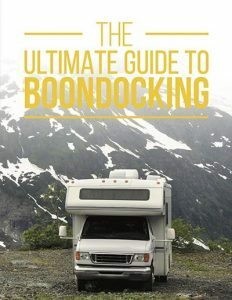 If you are a boondocking off-roader, you probably will want to have a rugged 4×4 ready to hit the dirt. If you decide on a luxury SUV, or a flashy car, you will most likely be sticking to the main roads. The tow bar looks like an A. It can either be attached to the bumper, or attached with a special addition, known as a breast plate. 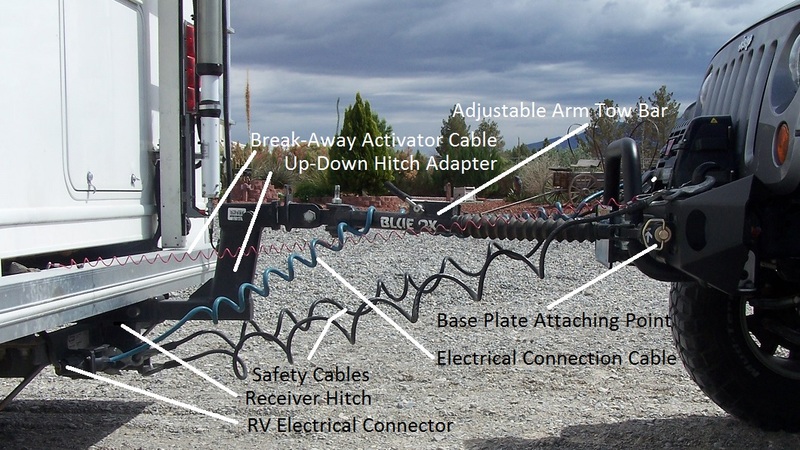 Each RV is designed to handle a certain weight, and manufacturers specify exactly how much weight can be towed. These numbers are not suggestions, but set limits. 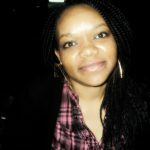 Adhere to them, or you will probably damage either (or both) your vehicles, and may even risk getting into an accident. The best tow vehicle does not register miles while it is being towed. Lists of tow-able pickups and SUV’s are available online. The vehicles in these lists are factory-approved tow-able. Just because you find an older model of a car can be towed, don’t assume that’s the case with the newer version. For example, in 2013, the Ford Escape was redesigned, and is no longer suitable for towing four-wheels-down behind an RV. Every other model before that can be safely towed. Everything you need to know about towing your particular vehicle can be found in your owner’s manual. If you do not have one, look online, and you are bound to find it there.